"For Blackened fish or chicken (great on any type of fish, especially on denser types of fish). The nice thing about this recipe is that the dish doesn't taste burnt even though you can get a nice blackened look. The sugar and the thyme caramelize and give it a wonderful flavor. All my friends love it." In a small jar with a lid, combine the paprika, thyme, onion powder, garlic powder, sugar, salt, pepper, cayenne pepper, oregano, nutmeg, and cumin. Seal securely and shake vigorously to blend. Store in a cool dry place. Shake jar before each use. 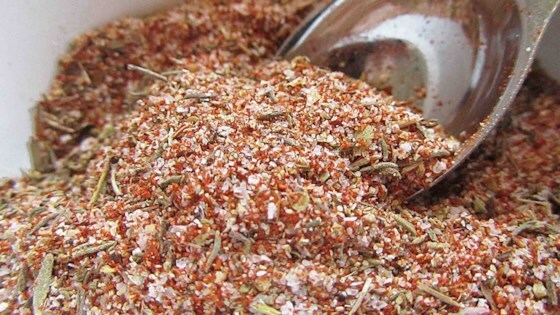 A perfectly balanced seasoning mix for homemade chili. We enjoyed this for our blackened halibut...without the sugar and nutmeg. I did adjust the salt just a bit because we're watching our sodium intake. This was just what I needed, thanks.